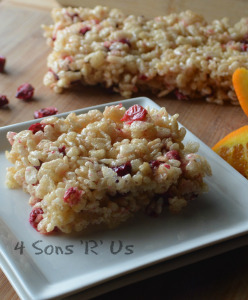 Cranberry and orange is such a dynamic flavor duo, and it seems to pop up a lot during Fall. We also think it’s perfect for The Winter Holidays. And Rice Krispie treats have and will always one of the kids’ favorite things to make and to eat. So combining the two was a win for everyone. They still got to make , play in, and eat sugary, sticky crunchy melted marshmallow goodness, and we got to experiment with adding in some gourmet (that’s a stretch, isn’t it?) grownup mix-ins. If you haven’t experimented with going beyond the basic Krispie treat, this recipe is a perfect starting point. The tartness of the dried cranberries is balanced out by the sweet orange and packed into every chewy bite. 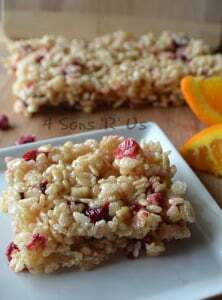 Traditional rice krispie treats are given a tasty face lift with the addition of dried cranberries and sweet orange flavor. Pour in both the cereal and dried cranberries, carefully stirring (so none spills out) until everything's evenly coated with the melted marshmallow. Coat a 9x13 baking dish with non stick spray, and then transfer the cereal to the dish. Use the back of a greased spatula to gently press the mixture down and out, evenly into the dish. Let the treats cool completely, then cut into squares before serving. Welcome to FF Meaghan! Guilty of having only made regular rice crispy treats albeit in fun shapes like dinosaurs and trains. I love cranberry and orange together and love how you’ve taken this favorite snack to a whole other level….absolutely gourmet! Thanks for bringing them to the party! I like your version with the cranberry and orange instead of the “traditional one”. Perfect for the holidays! Hi Meaghan, you have brought this classic up to modern standards! Thank you for bringing them to FF.